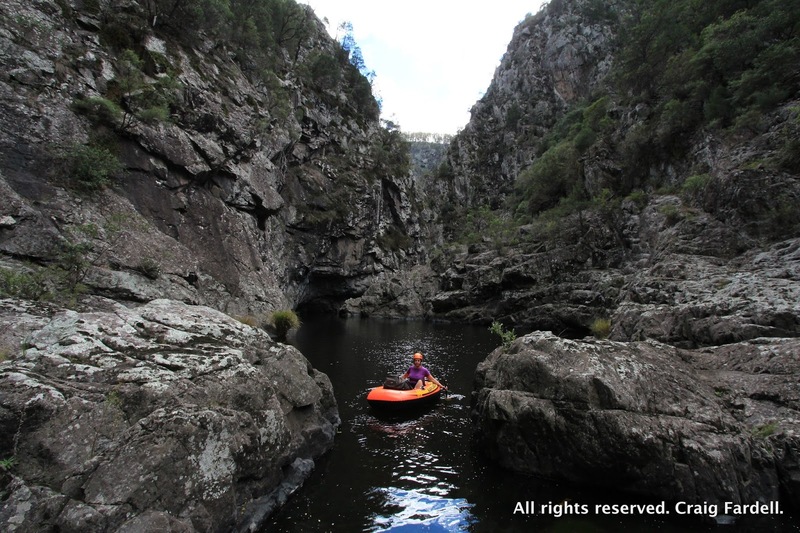 Our plan for this adventure is to travel downstream from Dangars Falls, rock hopping and paddling 5km through the most rugged section of Salsibury Waters (as the river is called) before reaching its junction with McDirty's Creek where we can pick up an easy ridge and return to the top of the plateau. 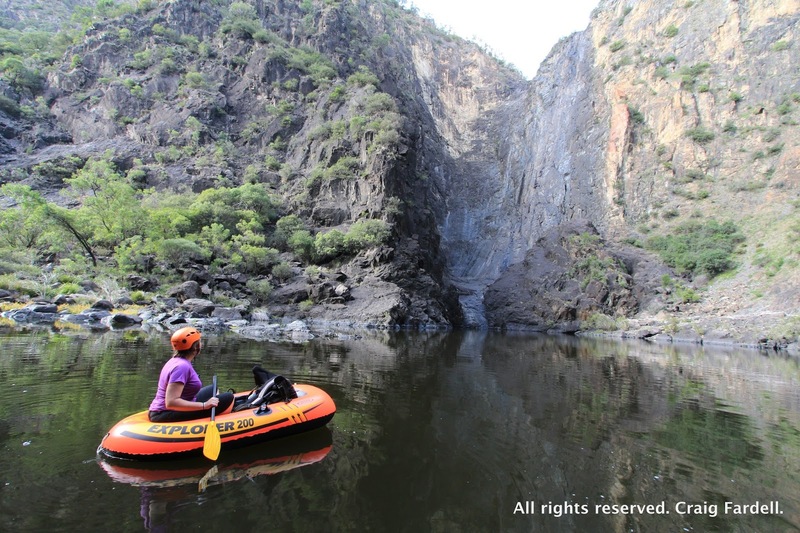 We are taking enough gear for an overnight trip including our trusty, inflatable vinyl boats which we will use to paddle the long, deep pools. 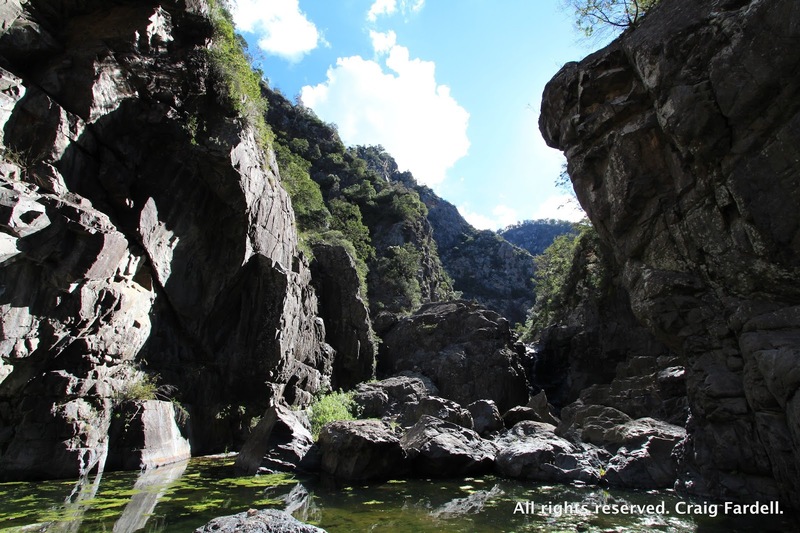 Located on the edge of Oxley Wild Rivers National Park, Dangars Falls is just 24km outside the regional centre of Armidale on the northern tablelands of NSW. The area at present is unfortunately in the grip of a drought and so Dangars Falls is, technically, no longer Dangars Falls. Although, I'm not sure what you call a waterfall with no water? It takes us a while to find a safe spot to blow up the boats as all around us are shattered, sharp fragments of rock fallen from the cliffs above. I tighten my climbing helmet until it is nearly strangling me. We pull the boats out of the packs and begin inflating them so we can cross the main pool that is at the base of the falls (that aren't falling). At first I think it is the booming echoes of our activity that have set off the white-winged choughs in the trees way up on the plateau - their whistling, fire-cracker calls are like a celebration - but then I look up and see the dark silhouette of a wedge-tailed eagle as it cruises over the tops of the stringy barks and peppermint gums. Then it begins slowly circling the round of sky above us. What an even more amazing sight it would have been to look up from this spot in 1866. To see this same patch of sky and across it, what must be considered one of the most remarkable spectacles ever seen here - Signor Vertelli walking a high wire, strung above the gorge, 600 feet in the air. Signor Vertelli was touring the east coast of Australia performing high-wire shows and he advertised his visit to Dangars Falls ahead of time. More than 200 people turned out to witness the spectacle. He walked across, then crossed again pushing a wheelbarrow, then somersaulted across, collecting “about eleven pounds” as payment from the crowd. The Armidale Express reported at the time that “There was an extensive series of picnics among the rocks, and the scenery being very fine, people enjoyed themselves heartily”. Our adventure seems to pale into insignificance beside such a feat, but there are challenges enough ahead for me. 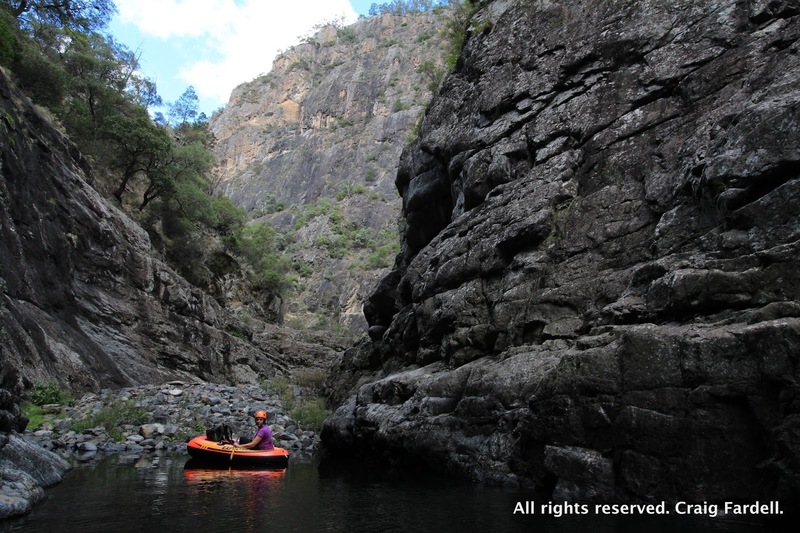 At first we make good, quick progress downstream across two big pools and some flat, easy rock. On reaching The Pinnacles (a series of crumbling, pointy spires on the right hand ridge) things slow down. 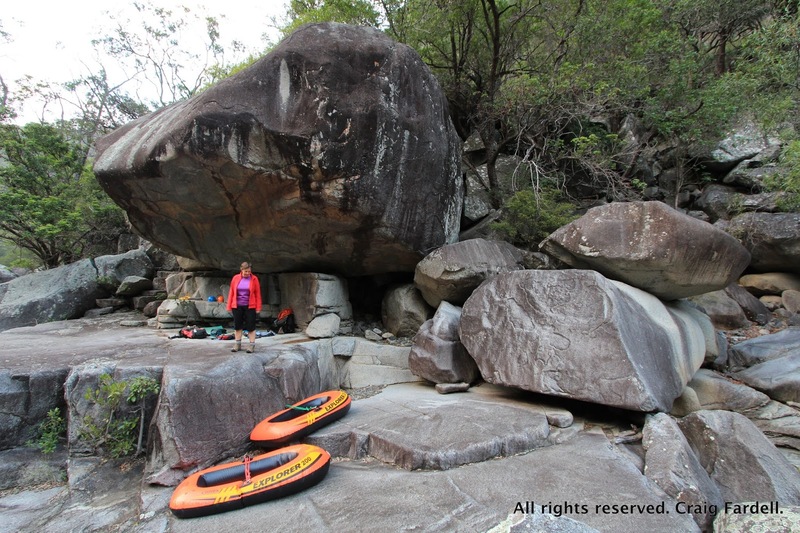 Big boulders prove tough to negotiate with the inflated boats sitting over our backpacks. There is a pretty waterfall on the bend and even in these drought conditions it still has enough of a trickle for us to fill our water bottles. From then on progress is frustratingly slow. The day has turned clear and sunny and it is warming up but the water in the pools is freezing cold and so our poor little boats sag and buckle and need repeated resuscitation as we drop them in and out of the deep pools. 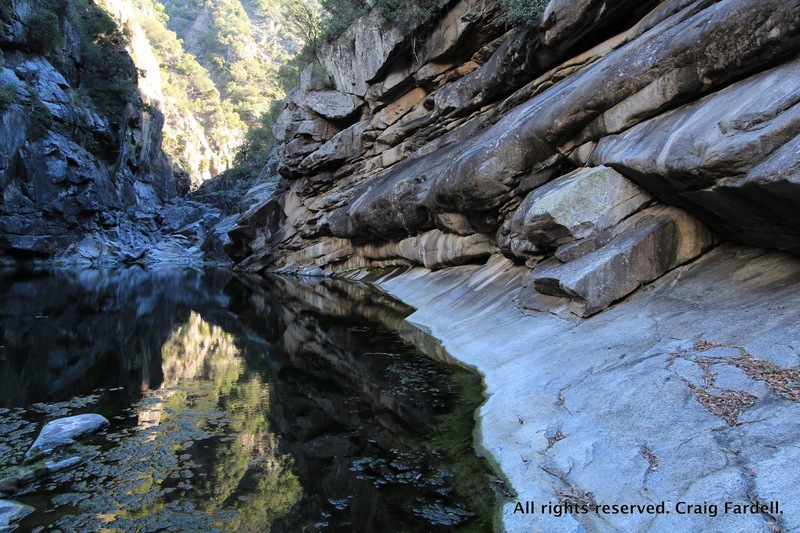 We pass beneath Rock Wallaby Lookout and the river turns into a 1km straight that in parts feels like a deep-cut culvert it is so narrow and carved so smoothly out of the rock. There are a couple of tricky traverses here as the low water level means we can't get the boats, and ourselves, down into the pools. 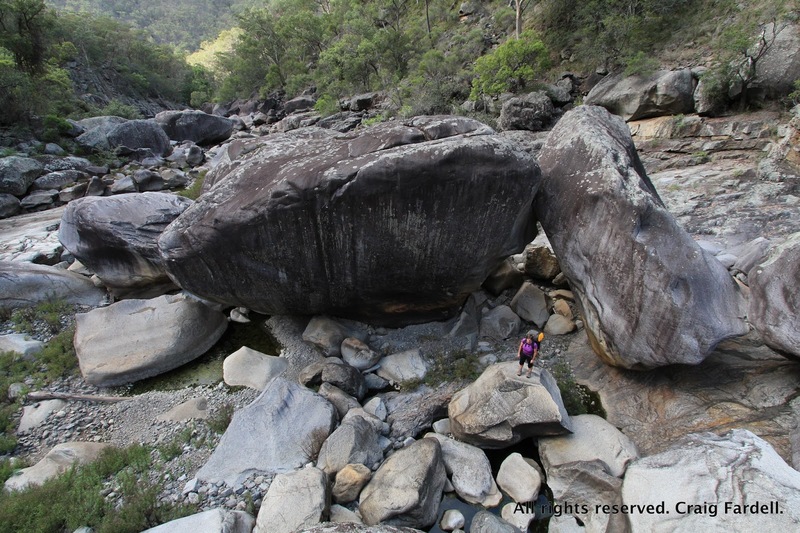 We slowly pick our way around the higher rock ledges and then continue the hard work of clambering over huge boulders. A few times we are forced to lower the packs and boats off rocks. By lunch time, I have to admit I am already exhausted. We began walking at 7am and it is hard work. Everything is a bit of blur for the next two hours as I become more fatigued and a little frustrated with the effort required in carrying the boats and hauling our packs in and out at every damn pool. But then at 2pm, there is a change: in the landscape and in me. 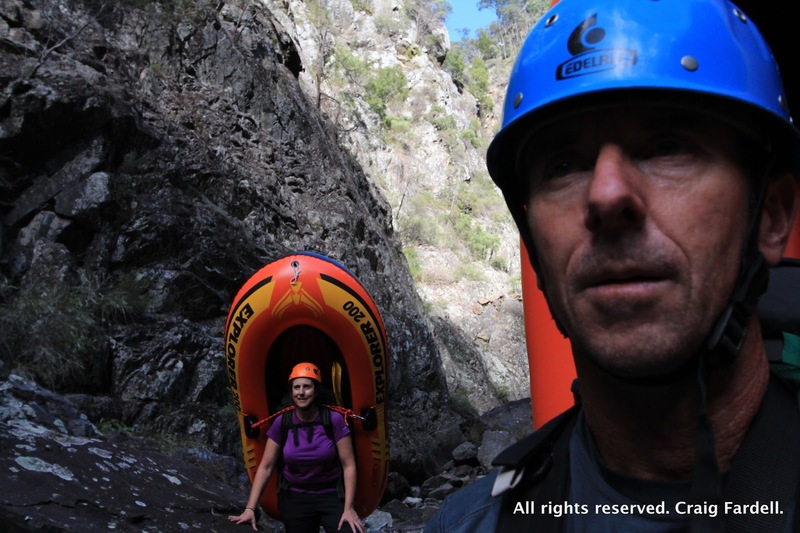 There is beauty in meeting the challenge of such an adventure and there is deep humour in deep exhaustion. I find both. The landscape itself matches my change - suddenly the rock has lost that crumbly, dangerous and rotten look and the sides of the river are more solid, like a soft grey granite. Thick slabs of this rock are layered one upon the other and they slope down towards the water, exposed along the sides in smooth, beautiful slabs. As we continue on, the pools are less frequent. I feel safer out of the fall zone of high cliffs and everything that was frustrating now seems hysterically funny. 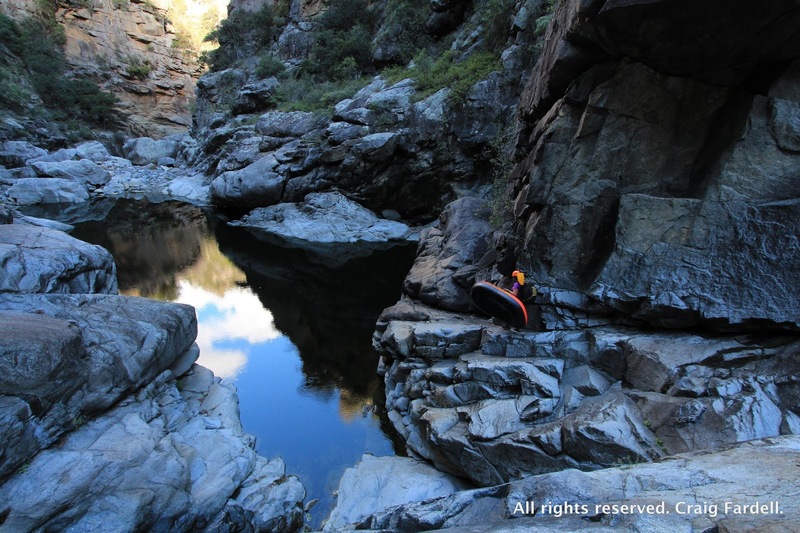 We stagger on, drop over a lovely waterfall and paddle the ridiculously serene and pretty pool below. The rugged peaks we have already passed provide a dramatic backdrop as we pick our way through each new obstacle. 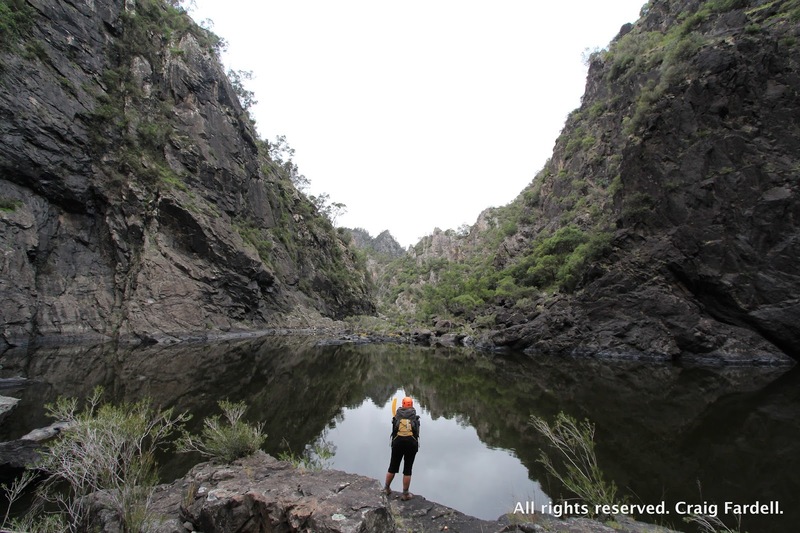 The gorge walls stay close and the river is narrow for much longer than we expect. In parts, Salisbury Waters disappears underground for hundreds of metres then reappears stripped of all algae and grime until crystal clear. We have to keep pushing on as there are no suitable campsites in the narrow river bed and there is no chance of climbing out yet - the ridges are too sheer, too loose, too wild. It is not until 4pm that we turn a bend and the gorge spits us out into an open, boulder strewn valley. Now the search begins for a suitable spot to camp. Even though the going is easier, with nothing left in my tank every step up and step down is a struggle. 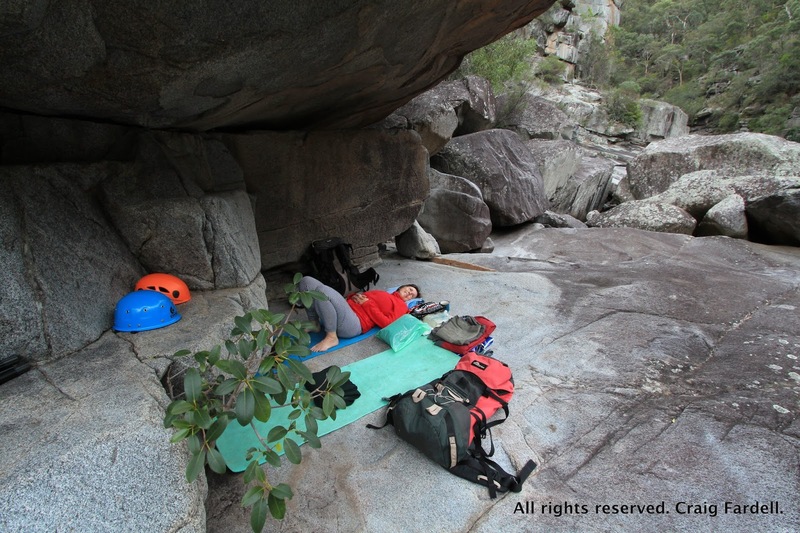 We find a reasonably nice slab of rock to sleep on and so dump the packs. But hoping for something better, we muster a last bit of energy to have a better look around. Without the packs and the boats to carry, rock hopping is a breeze and just a little further downstream we find a castle for the night - a beautiful flat shelf, a roof and ledges for our gear. McDirty's Creek and our exit ridge, up to Sarum Lookout, are just another 500m downstream. This is it. I am done for the day. Unfortunately, we have kept our packs as light as possible for this trip, knowing full well it would be a physical challenge. So, we have no cooker with us: no hot meal to refill our empty bodies, no relaxing afternoon cup of tea. I force down a few pieces of flat bread and some peanut butter, wash it down with Salsibury water and quietness descends once again, this time not out of awe and wonder but as a result of sheer exhaustion. If you search the internet for Dangars Gorge there are a few other reports of this trip including an entertaining and adventurous story from Don Hitchcock at http://donsmaps.com/dangarsgorge.html. 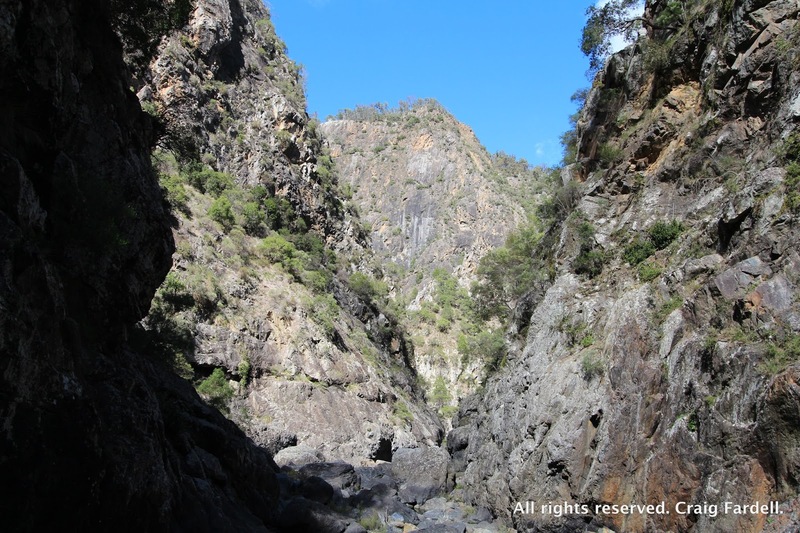 As Don points out on his blog, this walk does come with a warning - The Dangars Gorge trip is for fit, experienced and well prepared explorers. The trip is best done in warm weather and low water. We do not advise camping in the gorge proper due to rock fall. 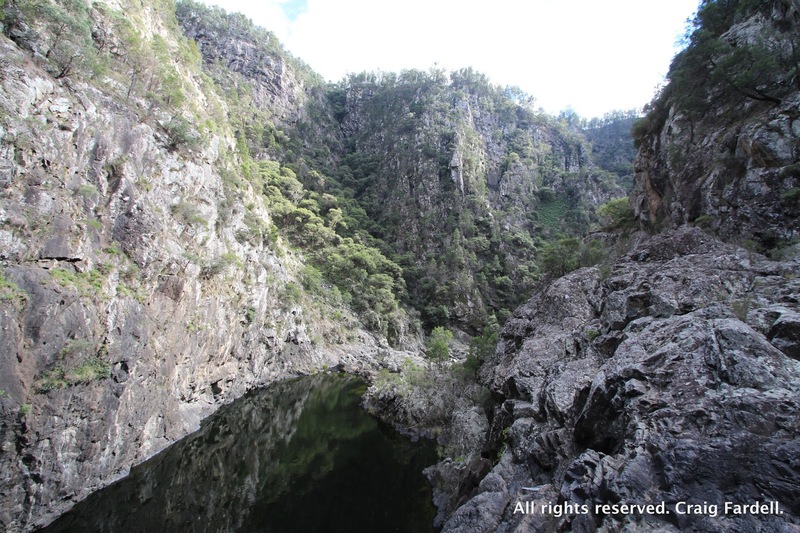 Oh, and it is probably not advisable to try tightrope walking across the top of the gorge and falls. Apart from that - it's a cracker! It's been a while since I've had the chance to get out so checking your blog has me inspired to make the time. Great bivvy as usual! Hi Darren, hope you've managed to get out since posting this comment! Just to rub things in we've been away on three weeks holiday getting out and about…bliss.